Be prepared: this will be a very long post. But, you asked me. Following the requests of some followers (thanks always for writing to me! ), I have just finished a document about damage evaluation. Not easy to do in just a few pages, but I did my best. Why damage evaluation? It is important to immediately highlight that this issue is becoming more and more important for compliance managers for at least three reasons. First, the globalization and the increase of the technological and operational complexity rises the exposure of companies to material and immaterial damages. Thus, compliance managers have often to deal with the quantification of damages in the context of trials, arbitrages and extra-judiciary settlements. Second, the legislations of European and North American countries are progressively increasing the liability of top managers for the eventual damages caused by their decisions to the company and to critical stakeholders such as customers, suppliers and partners. Third, the spread of consumers’ associations, and the even more frequent use of class actions, is increasing the number of judiciary proceedings against companies. The underlining idea of this document is that, even though damage evaluation and claim is necessary, it is associated with significant practical, procedural and ethical limitations that can negatively affect the managerial practice inducing moral distortions and irresponsible behavior. This document is organized in three sections. The first provides some fundamental definitions and classifications. The second describes the principles of damage evaluation in several situations such as damages for individuals, organizations, environmental damages, etc. The third section discusses some practical, procedural and ethical problems in the evaluation of damages. The document ends with a list of references that can be helpful for those interested in deepening their knowledge about this topic. Although definitions can vary in relation to the legislation of each country, damage is generally defined as a monetary compensation that is awarded by a court to an individual or to an organization who has been injured through the wrongful conduct of another party. The legal objective of damages is to restore, as best as possible, an injured party to the position the party was in before being harmed. This important assumption has clearly two important limitations that should be always taken into account when dealing with these issues. (The last section of the document will analyze in detail ethical problems associated with damage evaluation and damage claim). First, in many cases the injuries on people – physical, psychological, moral or reputational – cannot be fixed through the payment of a monetary compensation to the damaged party. Second, the monetarization of a damage is always affected by some degree of subjectivity of the person responsible of the evaluation and/or of the adopted economic model used to make such calculation. Generally, the jurisprudence around the world distinguishes between tree main categories of damages: compensatory, nominal and punitive damages. However, in the practice courts also refer to other categories such as treble damages and liquidated damages. Compensatory damages are given to compensate the plaintiff for the loss, injury, or harm suffered as a result of another’s breach of duty. For example, Merck had to pay massive compensatory damages for Vioxx, a painkiller for the treatment of arthritis and menstrual pain that lately was discovered being the cause of heart attacks, strokes and deaths. In this case compensations ranged from $18,000 to $1.79 million for the 20,591 heart-attack claims (that included 2,878 deaths), and from $5,000 to $820,000 for the 12,447 stroke claims (that included 590 related deaths). More information about the Vioxx case can be found in the website of Vioxx MDL Plaintiffs’ Steering Committee. Nominal damages are very small amount of money awarded to plaintiffs to prove they were right but did not suffer substantial harm. There are many famous nominal damages cases in the contemporary history. One of the most famous was granted to Winston Churchill who suited Louis Adamic for writing that the Prime Minister was drunk during a dinner at the White House. Although the jury acknowledged that Churchill was right, it did not identified a damage to the reputation of the Prime Minister who was award a shilling (25 cents). Punitive Damages are monetary compensations that go beyond the calculated value of the losses experienced by the plaintiff. Their objective is twofold: first, providing an additional punishment to the defendant for what is considered by the court an outrageous misconduct; second, minimizing the propensity of the defendant or others to re-iterate the same illicit behavior. Generally, punitive damages are awarded by a court when it recognizes aggravating circumstances such as bad faith, malice, violence, etc. 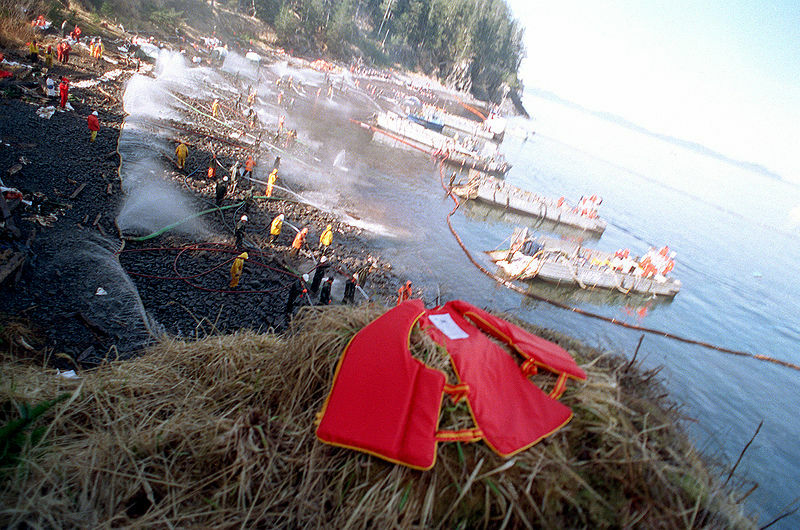 For example, 1994 a US jury awarded $5 billion punitive damages to Exxon for the Valdez environmental disaster because of the jury found Exxon reckless for leaving the responsibility of the Valdez’s activities to a captain with precedents of alcoholic addiction. This document will focus on compensatory damages. The reader interested in nominal and punitive damages can refer to the reference section available at the end of this document. Damages against people are generally associated with physical or psychological injuries. For example, a person can lose an harm during an accident in a product facility and/or being subjected to a serious psychological shock as a consequence of mobbing. An extreme, but unfortunately recurrent situation is, the compensation for the loss of a life. (An issue, that as already introduced, creates a lot of practical and moral problems that are discussed in section 3). Generally when a person is injured physically and/or psychologically the court is interested in the evaluation of two categories of damages, i.e. economic and non-economic. Economic damages are generally divided in three main categories. The first is the so called loss of earnings that is the loss of past, present and future income of the victim caused by a reduction or even the complete absence of the capability to work. The second is the value for the lost ability to perform non-market work such as support of daily activities in the family (e.g. taking care of the kids) or community service. The third is the past, present and future costs associated with medical care. The loss of earnings is a complex issue because the court is interested in the forecast of the earnings of the victim in the case he/she was not affected by the defendant behavior. The key problem is that there is a significant difference, theoretical and practical, between: 1) actual earnings, that is the earnings of the victim just before the accident, 2) the expected earnings, that is what that person was expected to earn in a “normal evolution of life” and 3) the potential earnings that is what that person could make in life considering his/her capabilities and potentialities. So, the easiest way for an expert witness is to rely on actual earnings and calculate the net present value of the annual income of the person until his/her expected retirement. The problem is that this method can underestimate what the victim would have earned along the life if the person is at the beginning of the career, or for example if he/she was planning or attending a master course that would upgrade his/her skills and capabilities. This calculation becomes even less reliable in the case the victim is a newborn or a child. 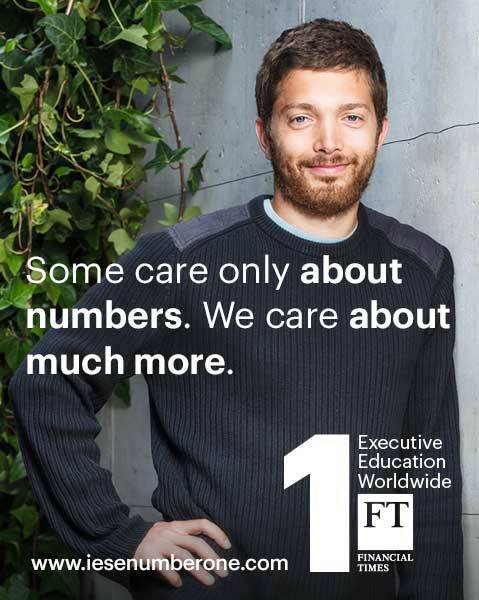 Many courts around the world are thus interested in the estimation of the earning capability of the victim that is generally developed through quite complex econometric models that take into account several important variables specific of the person – such as the functional (innate physical and mental abilities) and the vocational capacity (the interests, aspirations, professional knowledge) – and to the market and global conditions. More complex models even estimate the probability that that person could get a specific job (e.g. CEO of a company) instead of another (independent consultant) and thus calculate a range of potential earnings per year. Loss of capability to provide non-market work evaluates the incapability of the victim to perform activities in nonprofessional contexts such as nursing children, taking care of family day-to-day needs, participating to community services, etc. The evaluation is generally calculated considering the numbers of hours necessary to perform these activities per year and it is multiplied by the cost of a professional (e.g. an housekeeper) that would perform such activity. This monetary value per year is lately used to calculate the net present value of the non-market work along the life of the victim. Medical expenses are generally the easiest value that has to be estimated. It considers the cost of medical, psychological and para-medical support necessary to alleviate the victim’s pain and suffering caused by the accident object of the court proceeding. Medical expenses can reach very high values in the case the victim was seriously injured and will need continuous medical support. Loss of life enjoyment: that is limitations in the “normal” enjoyment of life. For example, if a person used to play football and has lost a leg, the court has to take into consideration the impact on the happiness and well living of the person caused by impossibility to continue practicing that sport. Loss of consortium: the loss of some pleasurable activities associated with marital life (including the possibility to pro-create). Non-economic damages are very difficult to evaluate and the practice shows significant national differences in the way court expect to calculate them. Expert witnesses generally adopt two methods to calculate non-economic damages. The first is to rely on official tables that estimate a per diem monetary value associated with each of the three aforementioned losses. These tables take into account the age of the person and several other biological conditions that can increase or decrease the estimated value. In this case, it is sufficient to calculate the present value of total of the non-economic damages along the life of the victim. The second method, is instead based on the willingness to pay approach, a statistical method that relies on the willingness of a statistically significant sample of people to be subjected to that the aforementioned pain and loss in return of a specific amount of money. (For example, the willingness to pay approach would evaluate the damage of having frequent headache asking to a statistically significant sample of people several questions like: “How much money would you expect to receive in order to suffer headaches for around 10 hours per week for the rest of your life?). It is evident that the calculation of non-economic damages is very subjective. As a consequences several governments have put a limitation in the financial amount that can be attributed to them by a court. Commercial Damages for firms are generally calculated using two fundamental approaches: lost profits or loss of business value. 2.2.1 Lost profits are defined as the difference between what a company would have earned with and without a defendant’s allegedly harmful behavior. This difference is calculated along a “damage period” that is generally the period during which the plaintiff experienced the aforementioned loss of profit. There are three main methods generally used to calculate lost profits damages. The first is the “Before and After” method that is based on the comparison of the profitability of the plaintiff’s business performances before and after the alleged harmful acts committed by the defendant (said in technical terms, the “Before and After” approach performs an event analysis that can take into account, in addition to the impact of the alleged harmful act, many other factors such as changes in market conditions, inflation, expected business growth, etc. etc.). For example, if a journal publishes an article providing false, negative information about the features of a product, this method will compare the profits generated by this product before and after the publication of the article. The second method is the “Yardstick”. It compares the profitability of the plaintiff to a comparable business activity that can be another firm with similar features or another business unit that was not affected by the alleged harmful acts. For example, if a service supplier (e.g. customer service of a telecommunication company) fails to provide adequate service in a specific region, the Yardstick approach will compare the performances of the business unit negatively affected by the problematic service with another one, similar, that was instead adequately served by the suppliers. The third approach is the “Company or Market Forecast Approach” that relies on sales and market projections to evaluate how the company would have performed without the allegedly harmful actions of the defendant. Let me use a very simplified example to show how this method works. Imagine that on average a company has grown during the last 10 years 3% per year. One day an employee decides to burn part of the infrastructures of this company (warehouse and part of the offices) and the company suffers significant operational and commercial problems. In addition to the direct material damage (the cost of full replacement of all infrastructures), the company forecast approach would consider the difference between the expected growth in the sales (3% more the previous year) and the actual value of sales. In the professional practice the company or market forecast approaches relies on very complex econometric models that take into consideration several variables such as variation in the components and final product prices, effects of macro-economic trends on the market where the company operates, etc. 2.2.2. Loss of business value. Generally the loss of business value is used when a business is significantly or completely destroyed (Kenneth M. Kolaski, Mark Kuga, Measuring Commercial Damages via Lost Profits or Loss of Business Value: Are these Measures Redundant or Distinguishable? Journal of Law and Commerce (Fall 1998) 1-24.). In this case, the damages can be calculated as the value of the business at the time it was completely destroyed. Also in the loss of business value evaluations three methods are commonly used. They have several conceptual and practical similarities with the three used in the lost for profits evaluations. . The first one is the Discounted Net Cash Flow method. It estimates the value of a firm as the present value of the future economic income to be derived by the owners of the business. The second one is the capital Market Approach. It estimates the value of a firm relying on what “rational capital market investors would pay to own the stock in the subject company”. The third one is the comparative Market Transaction Approach. It estimates the value of a firm by comparing it to comparable businesses that have been bought during a reasonably recent period of time. Environmental damages are associated with the modification and/or destruction of (part of) an ecosystem through air, sound or material pollution. Typical cases are the aforementioned Exxon Valdez and the BP Deepwater Horizon oil spills, the 2015 Volkswagen diesel scandal, the deforestation case of the Val di Susa highway in North of Italy, etc. Calculating an environmental damage is extremely difficult both in theoretical and practical terms. In theoretical terms the problem is that any asset has both an intrinsic and instrumental value. Something has intrinsic value if it is valuable in and for itself. The intrinsic value becomes extremely important when we are dealing with environmental resources. 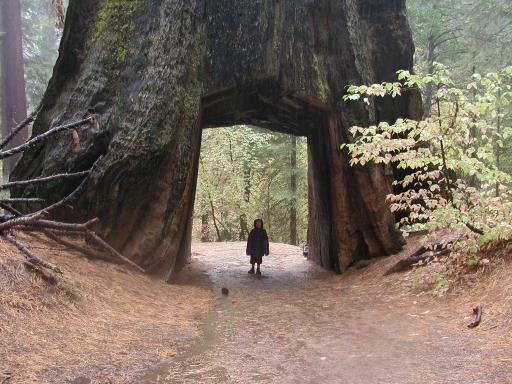 A 150 year old sequoia has an intrinsic value associated with its history (see e.g. the General Sherman Sequoia), its beauty, its impact on the local environment, etc. The instrumental value is instead calculated as a means to some other purposes. For example, the instrumental value of a sequoia can be calculated as a means for the wood market. It is evident that it is very difficult to find a precise and reliable way to evaluate the intrinsic value of a natural resource. Moreover, the very same resource can have very different instrumental values. Environmental economists have worked for over half of a century to find the best model that takes into account both the intrinsic and the instrumental value. Many models are available and each of them has limitations both in the way the environmental damage is conceptualized and calculated. An important strength of this approach is that it allows to easily identify the value that critical stakeholders (such as the local population) give to environmental resources. The main weakness of this method is that respondents very often don’t have sufficient knowledge to make a well-thought estimation. The issue here is that very often the primary rehabilitation is impossible to be achieved because some natural resources are permanently damaged and, as a consequence, the final evaluation is below its reasonable value since it focuses on what is a partial and not total rehabilitation. Companies can be requested to pay damages associated with many other situations. We briefly mention here two quite typical: damages in antitrust cases and damages for intellectual property infringements. In both cases the calculation of the damages is extremely complicated since it requires the development of complex econometric analysis. Damages in antitrust cases: The fundamental concept in antitrust cases is that a cartel, by colluding and manipulating prices in order to increase firms’ profits, causes an increase of the purchasing price of a specific good or service for consumers. Economic models show that a cartel can have three effects. The first is called “overcharge”, and it refers to the fact that consumers will pay an higher price. The second is the “substitution effect” and it refers to the fact that a number of people will decide to not buy that specific product or service given its high price. The third can be seen as a consequence of the second, and it is associated with the reduced profits that some competitors (that are not part of the cartel) will experience. Anti-trust cases generally try to evaluate the damages associated with the three aforementioned effect by calculating how the market have would evolved without the cartel’s manipulation (Anderson P.,Bolema, I., Geckil, I. Damages in Antitrust Cases, AEG Working Paper 2007). Damages for Intellectual Property Infringements: When a patent infringement is proved, the court is of course interested in evaluating the economic incidence of that infringement. The economic doctrine generally adopts two complementary methods: lost profits (lost royalties) of the patent holder and the unjust enrichment of the infringer. The unjust enrichment approach is focused on punishing the infringer by forcing it to disgorge all the profits associated with the infringement. In a complementary way, lost-of-profits approaches focus on the compensation of the patent holder. In both cases, damage models estimate how the market conditions would have changed in the case the patent infringement has not occurred, and, relying on that preliminary evaluation the damage of the infringement can be finally calculated (Mark Schankerman, Suzanne Scotchmer, Damages and injunctions in protecting intellectual property, RAND Journal of Economics, Vol. 32, No. 1, Spring 2001, pp. 199–220). The evaluation of damages has several ethical and practical problems. I briefly describe four of them, those that I consider most significant. First, as already mentioned in this document, in theory a damage claim has the objective to restore the “status quo ante”, that is to put the victim, organization, or society in the situation before the accident or the illegal practice has occurred. This is impossible in the great majority of the situations. Thus, the very premise of this practice has a very important limitations that should be taken into account. Several experts argue that damage claims create very often the illusion of the restoration of an ex-ante situation that has not occurred in reality. Second, damage claims assume that non-market parts of our life can be converted into an equivalent sum of money. There is no price for the intrinsic value of a leg lost or for pain associated with permanent psychological disorders. This has a consequence also in the managerial practice because very often the risks associated with permanent damages to people lives are underestimated with a monetization procedure. Such procedures create a situation of “moral disengagement” in which decision makers underestimate or justify, consciously and unconsciously, the consequences of their actions, their personal and professional responsibilities. The third issue is related to the second one and it is associated with life losses. The monetarization of a life is a very complex but also risky issue because of the potential cultural and psychological consequences on the people responsible of important decision making processes (e.g. deciding the safety and security parameters of blue-collars working in the construction sector). In some cases, judiciary evidence has showed the moral disengagement of decision makers that refer to the death of people as “fatalities” or “casualties” and look at statistics and numbers without considering that their decision can dramatically affect the life of hundreds or thousands of people. 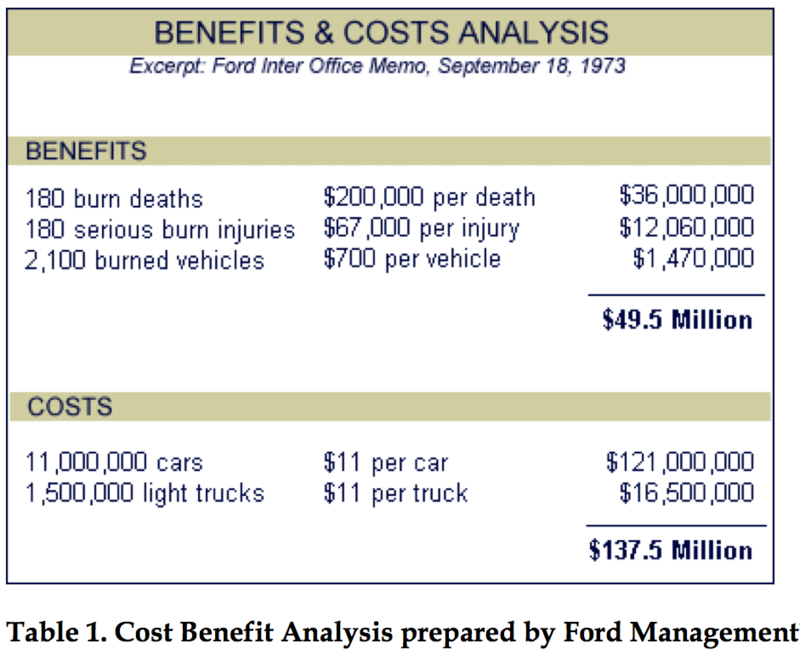 This is the case of the Ford Pinto: the management was conscious about a serious defect in the tank of the car (possibility of explosion in the case of collision) and put into a cost benefit analysis the costs associated with the reimbursement of the expected “fatalities” vs. the cost of a recall and replacement of the faulty tanks. Ford top management decided the first option since it was economically the most convenient (Douglas Birsch, John H. Fielder, The Ford Pinto Case, State University of New York Press). Please, see Picture 1 for the details of the cost-benefit analysis. The fourth issue is procedural and ethical at the same time. Generally courts around the world (European and North American in particular) are scared of the potential over-evaluation of damages. This creates an opposite effect: very often damages are under estimated. As already mentioned, many European courts estimate environmental damages with the costs associated with the best mitigation processes available. But unfortunately, in the great majority of the cases, these techniques do not replace the ex-ante conditions leaving significant damages to the environment (e.g. resources permanently destroyed), the local population and the local economy. A final result of this situation. Thomas J. Airone “Hedonic damages and the admissibility of expert testimony in Connecticut after Daubert v. Merrell Dow. Pharmaceuticals, inc.
Kenneth, Feinberg. 2006. What Is Life Worth? : The Inside Story of the 9/11 Fund and Its Effort to Compensate the Victims of September, PublicAffairs; New Ed edition. Kenneth, Feinberg. 2012. Who Gets What: Fair Compensation after Tragedy and Financial Upheaval, PublicAffairs. Stephen M. Homer and Frank Slesnick. The Valuation of Earning Capacity. Definition, Measurement and Evidence. Journal of Forensic Economics 12(1), 1999, pp. 13—32. Perry, R. Economic Loss, Punitive Damages, and the Exxon Valdez Litigation, Georgia Law Review, 45(407), 409-482. Peter Schuck. 1987. Agent Orange on Trial: Mass Toxic Disasters in the Courts, Belknap Press. Gerald M. Stern. 2008. The Buffalo Creek Disaster: How the Survivors of One of the Worst Disasters in Coal-Mining History Brought Suit Against the Coal Company- And Won. Vintage Press. Tom Tietenberg and Lynne Lewis, Environmental and Resources Economics, Pearson 2010. Jack B. Weinstein2012. Individual Justice in Mass Tort Litigation, Northwestern University Press.